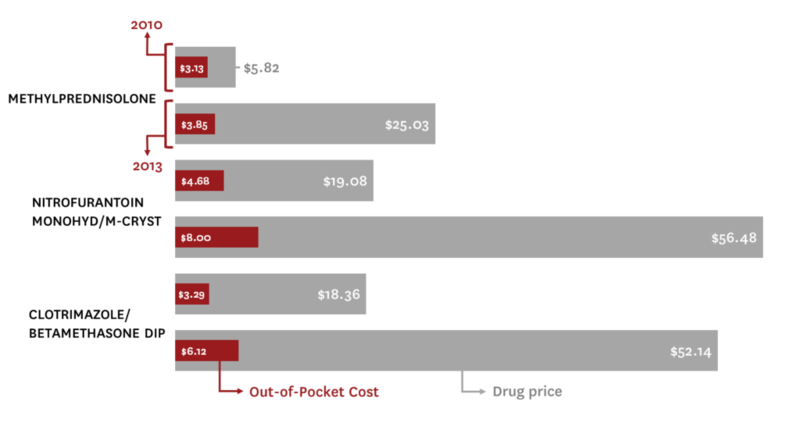 The graph above shows changes in out-of-pocket costs and drug prices for the three most widely-used generic drugs that at least doubled in price between 2010 and 2011. A new USC study reports that sudden price spikes for some generic drugs — such as the recently reported increases of a decades-old generic heart medication and an antibiotic — are becoming more common. “In most cases, this reflects an emerging strategy by generic manufacturers to identify and enter therapeutic areas with limited competition and raise prices substantially,” said Geoffrey Joyce, the study’s lead author and Schaeffer Center director of health policy. Joyce is also an associate professor at the USC School of Pharmacy and chair of the school’s pharmaceutical and health economics department. For consumers, this can mean soaring costs to purchase some drugs that are life-savers, sparking public outrage and leading many to question whether the market — which has historically functioned well — is still working. The researchers measured annual price changes between 2007 and 2013 using data from Medicare Part D. They assessed both the distribution of annual price changes across all generic products as well as price changes for the top 20 generics that had dramatic increases (see interactive below). The researchers also looked at how these price increases affected patient out-of-pocket spending. They found that patients’ cost-sharing tended to be low and increased much more minimally than the price increases for the drug, even when the price hikes persisted for more than one year. The study was co-authored by Laura E. Henkhaus, Laura Gascue and Julie Zissimopoulos. Funding for the research included the National Institutes of Health and the National Institute on Aging (award nos. NIH/NIA R01-AG-29514, NIH/NIA P01 AG33559-01A1 and NIH 1 RC4 AG039036-01). In addition, Henkhaus was supported by a USC School of Pharmacy Fellowship and a Schaeffer-Amgen Pre-Doctoral Fellowship.